Novelda is a lovely city located in the south of the “Comunidad Valenciana” in the Valle Medio del Vinalopó, on the right-hand bank of the Vinalopó River, at over a height of 241 meters above the sea level. Novelda is a very dynamic and modern city, and is referred to as Modernist or "Art nouveau" with its characteristic architectural and decorative style. The industry is built on growing grapes which are packed in Vinalopó with their own denomination of origin, the packing of spices, teas and infusions as well as an industry of marble and natural stone. La Mola Castle rises from a small plain 360 m above sea level, 3km northeast from the city of Novelda. A fortress of Islamic origin, it was built in the late 12th century. By the end of the 14th century the Castle was reformed by the Christians who built a magnificent triangular tower. In 1931 it was declared a Historical Artistic Monument of National Interest. 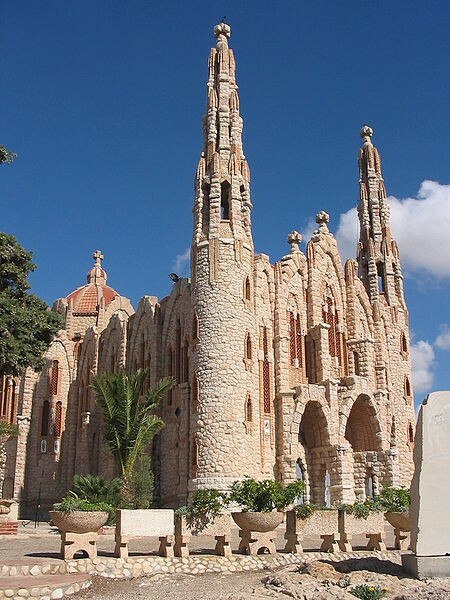 Next to La Mola Castle is the stunning Saint Mary Magdalene Sanctuary. This religious building was designed by local Novelda based engineer José Sala Sala, who was influenced by Catalonian Modernism. Work on the Sanctuary in 1918 and finished in 1946. The main façade features two 25 meter high side towers that end in a stone cross, also found on the cupola and upper arches of the façade. The outside of the building is decorated with modernist motifs that have their origin in medieval and Baroque styles. The pebbles are from the Vinalopó River with polychrome painted tiles, ceramics and bricks, which make this building an icon of Europe Modernism. Inside the Sanctuary there is a rectangular nave with two adjoining side areas revealing large paintings depicting scenes from the saints’ lives and the shrine of Santa Maria Magdalena. Behind the alter there is a beautiful painting attributed to Gastón Castelló. So if you enjoy stunning views and spectacular buildings you will not be disappointed with a visit to La Mola’s Castle and Saint Mary Magdalene Sanctuary. See below to view a selection of our bargain properties near Novelda.